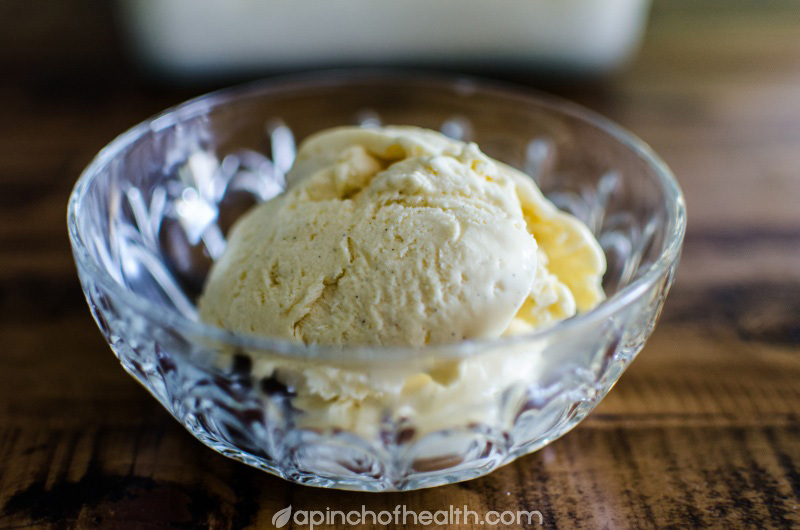 This is an awesome low carb ice cream recipe!!! New creamy smooth low carb ice cream recipe that does not require an ice cream maker or frequent beating/whisking while it freezes. You just bung it in the freezer for 8-10 hours and viola! The reason behind its creaminess is the high fat content which is perfect for low carb, when I converted this to low carb I was unsure if it would work as I raised the fat content again by removing the milk and replacing with more cream. I also used more egg yolks because I had 7 to use up, but it has turned out great! Any higher fat though and you may have trouble with the fat separating. Now I used tagatose in this recipe but it wont matter what you use as far as I know, I might've used erythritol in my lemon sage ice cream (just looked it was xylitol, I'm not sure how erythritol will go as it does crystallise in jams) that I did a few years ago which turned out great. But if you use a liquid sweetener you will then be increasing the water content which may increase the chances of it going icy. You're meant to leave it on the bench for 20 mins to soften a little before scooping but I didnt find this to be a problem at all and I would've had mine in the freezer for 20 or so hours. Mine was perfect, not hard at all. I will experiment with other flavours next. Combine yolks with sweetener in heat proof bowl then whisk over simmering water for 6-8 minutes until mixture is pale, thick and forms a ribbon trail. Take off heat and whisk in vanilla, keep whisking until cool then whisk in 100mls of cream. With the remaining cream whip in a separate bowl until soft peaks form. Fold half of this into the yolk mixture until almost combined and then gently fold the rest until combined. Pour into a freezer proof container, I like to place a sheet of baking paper over the top of the icecream to help protect it then put the lid on and freeze for 8-10 hours. Once ready allow up to 20 mins on the bench to soften before scooping, I didn't find this necessary! The post was edited 1 time, last by Sherrie: updated photo ( May 4th 2014, 5:58pm ). ok the photo from the other day has been annoying me so I did a new one today which I think is much better! I scooped the icecream immediately after taking it out of the freezer, its not hard at all and easy to scoop! I had used them for mini pavlovas for my daughters birthday the weekend before! Oh and another thought, are you on facebook? I shared a recipe someone posted on facebook that I plan to play with. Its a nut muesli recipe that had egg whites in it. Have you tried any different flavours? Hey Danni no, I don't make sweet things much these days, I've kind of gone off them. I did make my own gelato, maybe just before or just after Christmas. The espresso one was nice but the chocolate whilst a good texture was too rich. I keep meaning to play with them but gelato is something that needs to be eaten pretty fresh, the longer you keep it the more icy it gets and I guess I just don't want it enough. But you should be able to experiment with them yourself, but the more you increase the water content the more care you should give it to avoid it going hard or icy. After reading Sherrie's post about this lovely ice cream, I thought I should be able to make this recipe legally LC by replacing the sugar - but with what? Not familiar with tagatose but have splenda, erythritol, and a liquid product called EZ Sweetz (contains sucralose, potassium sorbate, sodium bonzoate, succinic acide, citric acid - yikes! a chemistry set) that I haven't tried yet. Ooops - I searched Amazon for "tagatose," found "Swerve" a product that's a "combination of erythritol and oligosaccharides that provide excellent baking and cooking functionality." Are tagatose & erythritol the same? All these sweeteners are new to me. What else am I forgetting that's likely to derail this plan for intensely flavored bittersweet chocolate goodness? The post was edited 1 time, last by pamchesbay ( Aug 16th 2015, 1:50pm ). It seems Tagatose is hard to get now unless you live in Europe, which is a shame because as long as you don't bake with it its pretty reliable and is the best tasting. I am in my final bag of tagatose and just using it sparingly when I make a hot chocolate. 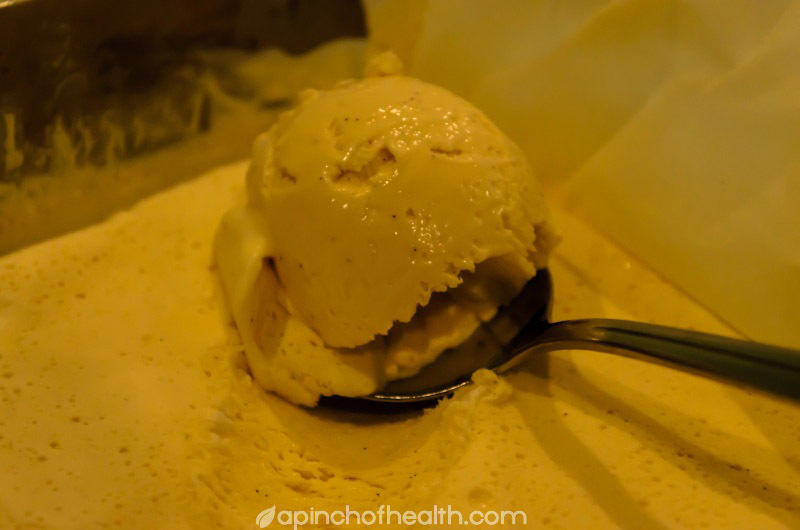 I've posted a lemon and sage ice cream recipe here that didn't use eggs or tagatose. It was either xylitol or erythritol that I used. The biggest problem with erythritol is that it has a tendency to crystalise. I made a coffee gelato earlier in the year but forgot to post it and now that my hard drive died on me a couple of weeks ago I've likely lost it, so will have to start again but too cold here at the moment for making ice cream. My next ice cream I will likely try with the proportions in my baked custard recipe because its not eggy at all. I haven't made gelato yet. Would love to give it a try. Your hard drive crashed? What a bummer. My Mac crashed a few months ago, I feel your pain.